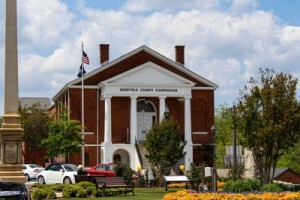 The Edgefield County Council held a joint public hearing regarding two ordinances at their regularly scheduled monthly meeting, Tuesday, June 4. Neither the ordinance to expand the Highway Overlay District from Highway 25 South from the Aiken County line to the beginning of Greenhouse Road nor the ordinance to allow the county to issue a general operating bond for $1.2 million to fund renovations to the Kneece Building as well as to address capital improvements to other county buildings received public input. Thus, the second readings of each of these ordinances passed unanimously. While Council attempted to utilize the Consent Agenda once again to expedite business, Councilman Norman Dorn asked that all items listed there under be moved to New Business on the regular agenda. One of those items that would have been on the consent agenda, a consideration to lift the county-wide hiring freeze, did receive discussion after its repositioning. Council was informed that Supervisor of Roads and Bridges, Jimmy Feagin, asked for the lift of the hiring freeze in order to fill an open position in his office. An employee with his department, a Heavy Equipment Operator, recently retired, and Council was advised that without the filling of this position some projects within the county would not get done. The measure to lift the freeze passed in a 3-2 vote; Councilman Dorn and Councilwoman Genia Blackwell voted negatively. In his opposition to the move, Dorn stated he felt the county should be “lessening government instead of increasing it.” Blackwell’s opposition seemed to stem from concerns about finding qualified personnel. She questioned whether or not the new employee would need to have a CDL license. Administrator Lynn Strom stated the county preferred to hire an individual with such a qualification but that was not a specified requirement. It was noted that this position is not a new position and that any new hire would come in at a lower pay scale than the retiring employee. Council was advised that two projects undertaken for the 2012-2013 fiscal year will not be completed by the end June 30, 2013, the end of said fiscal year. The repairs to the courthouse roof will be left unfinished as asbestos was found which has increased the cost associated with the repairs. Also, $3,600 had been budgeted for painting the Auditor’s Office, but that, too, will be delayed as all quotes received for this project came in over budget. Council unanimously approved a request to place the unspent funds from these projects into an escrow account in order for the improvements to be completed in the upcoming fiscal year. Third readings were given to the ordinance amending the General Operating and Ancillary Budget for 2012-2013 and to the ordinance providing for the 2013-2014 General Operating Budget that also establishes the Ancillary Budgets. While these two measures both passed unanimously in their first two readings, at their third readings the ordinances passed 4-1. Mr. Dorn stated “I do not know the details,” when casting his vote against both measures. In an effort to comply with state law, Council was all in agreement to change the current rate of pay for jurors who serve in Magistrate Court from $20 a day with no mileage to $10 per day plus mileage. Council was made aware of an emergency need for replacement of an HVAC unit at the Kneece building. According to Administrator Strom, one of the units has quit working, and the county’s contracted HVAC maintenance repairmen do not believe the unit is repairable. The unit in question services a portion of the building not yet renovated, and its replacement is deemed necessary as the system would not be able to work properly off of one unit. Strom advised Council that the county has already received one bid for the repairs but stated she would also seek two other bids for the project. She requested funding for the project come from the contingency fund which currently has a balance near $21,000. Councilwoman Blackwell made a motion to approve the replacement with the stipulation that the project not exceed $21,000. Council all agreed to this. In her closing comments to Council, Administrator Strom stated that according to the SC Department of Transportation, work being done on a bridge on Rachel Road will not be completed until the end of July. This means travelers wishing to use that road will need to find an alternate route. Strom also announced to Council that Edgefield County is now listed as a Work Ready Community. This distinction allows differing citizens within the community to take tests that will showcase the skill levels in our area. The move to obtain this recognition came at the urging of the state that all counties in South Carolina seek to become Work Ready Communities in an effort to draw industries to the state. Strom said she is hopeful the move will entice more industries to move to Edgefield County. Chairman Dean Campbell thanked those in attendance for coming, and with no other business to discuss, the meeting was adjourned.